Co-design and co-delivery are part of the ethos of the McPin Foundation. We have just completed our second successful three-day training for Peer Evaluators with Macmillan cancer support. Running the training a second time gave us the freedom to improve and develop materials and content from the first time around. We are proud to add another facet to the McPin model of co-production in health research. We can now offer bespoke research skills training to individuals and organisations that want to learn about peer research methods. 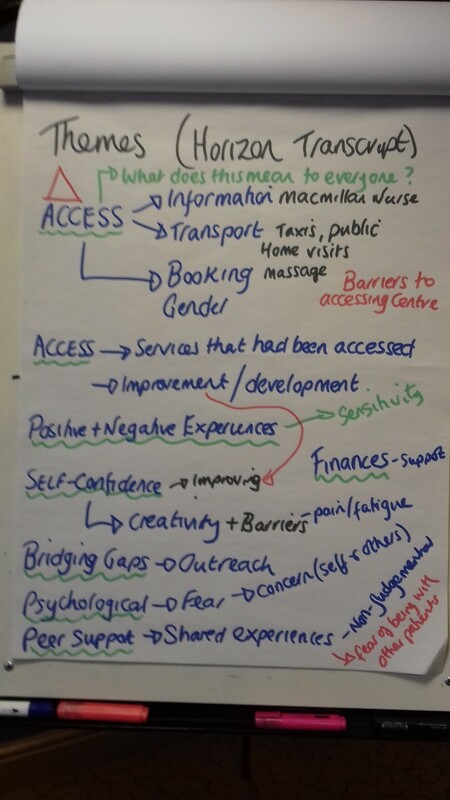 Co-design: The training programme built upon existing McPin training materials and was further developed by a McPin researcher using their own lived experience of cancer to inform the training topics, combined with vocational skills as a researcher and co-facilitator of mental health training. This was then piloted within the organisation to gather feedback on the applicability and ease of understanding, and revisions were made based on these recommendations. Co-delivery: This same researcher also co-facilitated the training alongside an experienced McPin senior researcher with extensive knowledge of research methods. Training aims: The aim of the training was to provide a group of Macmillan volunteers with an understanding of research methods to use in future co-produced evaluations of their services. 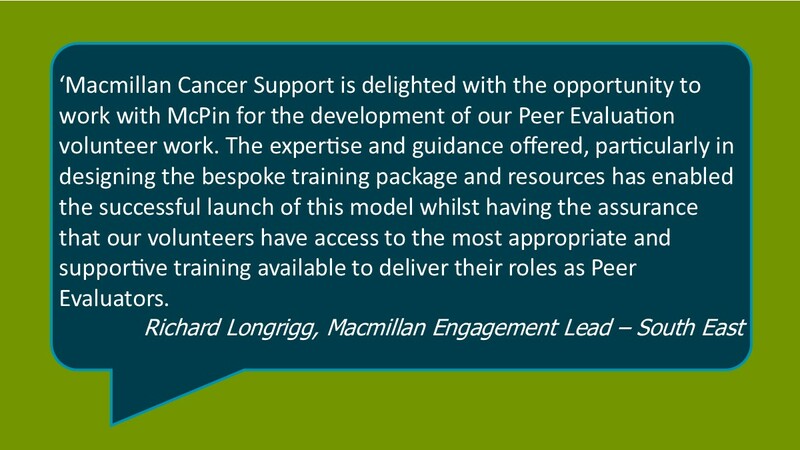 Following the training, the materials were refined so that they could be handed over to Macmillan to carry this training forward and roll-out to others enrolling on the Macmillan Peer Evaluator programme. Therefore, the materials needed to be easy to follow and easy to adapt to specific groups and so accompanying slide notes and guidance were part of the end product. One of the challenges in developing a start to finish approach to Peer Evaluation was to be able to pitch the training content and delivery so that we met the needs of people from a range of backgrounds. We created a flexible training programme which we were able to adapt to the audience, including optional exercises in response to the group and using reflective space to listen to and manage expectations for each day. Co-production in cancer: The idea of co-production was carried through to the training cohort, where participants were encouraged to reflect on what they as individuals could bring to the role of Peer Evaluators. 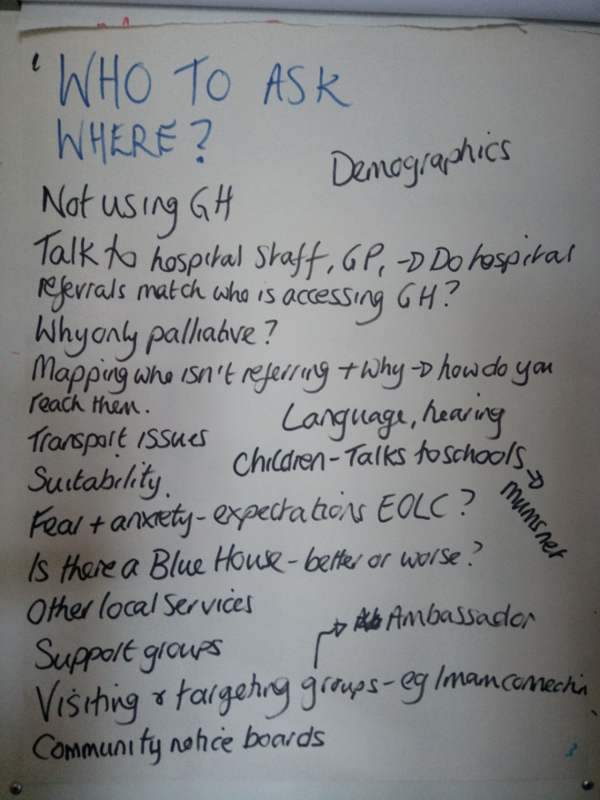 In doing this they were encouraged initially to draw upon their lived experience of a cancer diagnosis and then on skills or expertise they gained through previous or current employment. The benefit of having a wide range of employment experience is obviously not unique to this group, but is sometimes overlooked in the shadow of a lived experience of cancer. However, what quickly became apparent was how the varying skills of different team members in the room could be applied to a team of Peer Evaluators, for example copywriting or design skills to creating study recruitment posters. It was this sense of building a team that also added value to hosting the three-day training course in this way. The training encouraged potential Peer Evaluators to think about how they can use their lived experience in recruiting participants, producing interview schedules and questionnaires, and in carrying out data collection and thematic analysis. It is hoped that involving those with lived experience of cancer as evaluators, as with mental health, will result in meaningful, co-produced, service evaluations that are more relevant to the day to day lives of people with cancer. We also discussed ethical considerations for both researchers and research participants, and how to use supervision and personal boundaries to manage the emotional aspects of the work. As with mental health research, sharing personal experiences involves some degree of risk, which must be managed sensitively in order to protect all involved. Much of the three-day training was experiential, with practical exercises to build confidence in using skills such as interviewing scattered throughout the training. Whilst days one and two focused on research methods, day three consolidated the learning by putting this into practice, with participants designing and conducting interviews and identifying themes from interview transcripts. McPin Peer Researchers joined on the afternoon of day three to give an overview of their work and experiences of using lived experience to make research more applicable to accessible to a wider audience. Feedback at the end of day three showed that the sharing of these experiences, as well as the experiential method of learning added value to the training. We really enjoyed creating and delivering this training, and were pleased to hear that the first cohort are now working together as a team to develop an understanding of patient support needs following treatment for cancer.